The Ukrainian Verkhovna Rada adopted a resolution on the immediate disarmament of illegal armed groups. The most notorious is the nationalistic Right Sector, whose members have been involved in the bloodiest turmoil in Ukraine’s recent past. The vote passed by the parliament on 01 April 2014 allowed for the banning of Right Sector if it refuses to give up arms. The decision was supported by 256 MPs, while the minimum needed to legitimate it is 220 votes. “Considering the extraordinary public and political situation in the country, aggravation of the crime rate and systematical provocations on the part of foreign citizens in the south-east of Ukraine and in Kiev, the Parliament of Ukraine decrees to oblige the Ministry of Internal Affairs of Ukraine and Security Service of Ukraine to immediately disarm illegal armed formations,” RIA Novosti quoted the Rada resolution. On 31 March 2014, Ukraine’s acting Interior Minister Arsen Avakov urged militants to clear out of the capital following a shootout in downtown Kiev instigated by a Right Sector member injured three people, including Deputy Mayor Bogdan Dubas. A police special operations taskforce armed with automatic weapons besieged the Dnepr Hotel, where Right Sector had been based for the last several weeks, and delivered an ultimatum to abandon the building leaving all weapons behind. In return, police promised a safe corridor out of the city for the militants, who primarily arrived to Kiev from western regions of Ukraine. The pro-Europe protest movement of 2013-2014 was augmented by members of the violent far-right militant group known as ‘Pravy Sektor’ (Right Sector), a loose alliance of nationalist organizations. Some see the core strength of the revolt amidst the “Right Sector” movement and football hooligans. In the 2001 version of Article 296 of the Criminal Code, hooliganism is “flagrant violation of public order motivated by overt disrespect for society, accompanied by particular impudence or exceptional cynicism.” After anti-protest laws were enacted on 16 January 2014, peaceful anti-government demonstrations in Ukraine escalated into fierce street battles in the capital Kiev between radical nationalists and security forces, leaving hundreds wounded and prompting warnings of a civil war. On 22 January 2014 US State Department Deputy Spokesperson Marie Harf said "The United States strongly condemns the increasing violence on the streets of Kyiv, which has led to casualties and the shooting deaths of two protesters. We urge all sides to immediately de-escalate the situation and refrain from violence. Increased tensions in Ukraine are a direct consequence of the Ukrainian government’s failure to engage in real dialogue and the passage of anti-democratic legislation on January 16. However, the aggressive actions of members of extreme-right group Pravy Sektor are not acceptable and are inflaming conditions on the streets and undermining the efforts of peaceful protestors. We likewise deplore violence by unofficial groups known as “titushki.” We also condemn the targeted attacks against journalists and peaceful protestors, including detentions." The titushky are burly young men dressed in sports gear who act as agents provocateurs. They attack protesters or provoke clashes with the aim of tarnishing the peaceful protests. The term "titushky" was coined in 2013 after two journalists were beaten up in Kyiv by a group of athletically built youth. Titushky are named after Vadym Titushko -- one of three men who received suspended sentences over the May 2013 attack. Titushko apparently is not very pleased at the association. The Tryzub (Trident) movement initiated the creation of the “Right Sector” – a union of nationalist movements taking part in the protests. It also included the Social-Nationalist Assembly is a member – as well as smaller organizations, like Carpathian Sich, White Hammer, etc.). The core of Pravy sektor is made of the activists of radical groups, including ‘Trizub’, ‘Patriot of Ukraine’, as well as UNA-UNSO and the ‘Svoboda’ (Freedom) ultra-right party. Perpetrators of racially motivated incidents tended to be from extremist groups, including: skinheads, the Ukrainian National Labor Party, Group 82, Patriot of Ukraine, and Svoboda (Freedom). Many of these neo-Nazi and skinhead groups have connections to groups in Europe and the US. In addition to hundreds of blue and yellow Ukrainian flag and the red and black flag associated with Ukrainian nationalists, there were also the specific red and black flags of Ukrainian National Assembly-Ukrainian National Self-Defense (UNA-UNSO) [and of the World War II-era Ukrainian Insurgent Army (UPA)] and the Congress of Ukrainian Nationalists (KUN), the blue flags of the Svoboda party and the yellow flags of Tryzub, another group claiming to be followers of Stepan Bandera, the World War II resistance leader. Bandera, who was killed by a Soviet spy agent in 1959 while living in exile in post-war Munich, was later proclaimed ‘a martyr’ and a ‘national hero’ by the offspring of the founding fathers of the Ukrainian ultra-right movement. The presence of the group added a volatile element to the standoff that analysts say both the government and the mainstream opposition are struggling to contend with. The particularly radical protesters at Hrushevskoho Street say they are ready to escalate things further. If their core demand for the president to step down is not met, they say, the fight will continue. Armed with wooden sticks or iron rods and for the most part young men, they dominated the city's main street, Khreshchatyk. Many wore construction or ski helmets and goggles. They built barricades out of snow-filled sacks, and pried cobblestones from the icy road to throw at police. The Pravy Sektor manifesto, announced in early January 2014 when Ukrainian radicals staged their first attacks on the police, features a large dose of firey rhetoric: “All those who at this point would try to tame the revolutionary energy of the masses should be proclaimed traitors and punished in the most severe way. The time of peaceful singing and dancing at Maidan is over. This is waste of time. There can be no negotiations, no compromise with the ruling gang. We will carry high the fire of national revolution.” Members of the “Right Sector” write that peaceful protests of Ukrainians led to nothing and now the struggle has reached a new level. “Death to the regime of internal occupation! Freedom or death! Glory to Ukraine!” says the group in their appeal to the nation. Extremist groups in Ukraine espouse a wide range of ideologies. Groups such as the UNA-UNSO and Patriot of Ukraine are ultra nationalists, while the Ukrainian National-Labor Party and the Ukrainian Movement Against Illegal Immigration have a neo-Nazi following. The group Bratsvo has an anarchic outlook while the Russia-based Eurasian Youth Union promotes Russian neo-imperialism. These fringe groups lack political clout but promote intolerant ideologies, which can influence alienated youth and contribute to social problems such as hate crimes. Svoboda (Freedom), a "neofascist" party, first made it into parliament in the elections in the fall of 2012. Headed by Oleh Tyahnybok [Oleh Tjahnybok], Svoboda called for all Soviet monuments to be dismantled and for the country to finally come to terms with its communist past. He had demanded introduction of a paragraph called nationality in Ukrainian passport so that non Ukrainians will not be accepted into government jobs. 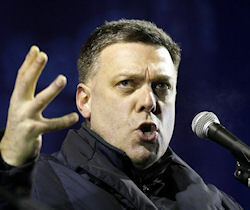 In July 2004, the media reported that the then-main opposition bloc in parliament, Our Ukraine, expelled Oleh Tyahnybok, a Member of Parliament (MP) who made an anti-Semitic speech during a campaign rally in Ivano-Frankivsk Oblast. Tyahnybok called Ukrainians "to take automatic guns and fight against Moskali ( Russians), Germans, *** ( Jews) and other scum". A regional court ordered that charges of inciting ethnic hatred be dropped because of a lack of sufficient legal grounds to open a criminal case. Moreover, in a March 29, 2005 national television interview, Tyahnybok refused to apologize for his campaign speech. Svoboda won no seats in the 2007 elections. In 2010 Oleh Tiahnybok polled around one percent in pre-election surveys. Tiahnybok was trying to take advantage of the political vacuum in Western Ukraine left by the collapse of Yushchenko's popularity. Originally a leader of the far-right, he moderated his message somewhat in recent years by focusing on more broadly palatable -- at least in Western Ukraine -- nationalist themes. Tiahnybokhad a limited pre-election presence, with messages to support the Ukrainian language and culture. He said that Ukraine's current political establishment will face God's wrath for their corruption and willingness to embrace Moscow. Svoboda's star had been on the rise after it won a plurality (34%) of votes in a controversial March 2009 local election in Ternopil Oblast in which Yatsenyuk and Tymoshenko-affiliated parties did not participate. Nationalist party Svoboda won 34 percent of the vote, Presidential Secretariat head Viktor Baloha's United Center (UC) came in a surprising second with 14 percent of the vote, and Party of Regions (Regions) collected a surprisingly high 10 percent of the vote. PM Tymoshenko's BYuT, which did not actively campaign in the days leading to the election, received an anemic eight percent of the vote, and a fractured Our Ukraine managed to get only five percent. Following the 2006 election, the two controlled 102 of 120. Svoboda gained 50 seats on the new council, 11 short of an outright majority. Gorbachev-era political protests in Ukraine bristled with the forbidden Ukrainian flag, but those who carried them in such circumstances, brave as they were, could find safety in numbers. Not so the town council of Ternopil, which on March 20, 1990 reestablished the blue-and-yellow flag as well as Ukraine’s stoical national anthem ‘Ukraine Has Not Yet Died.’ Ternopil was followed by the oblast council of Lviv, which similarly mandated the use of proscribed national symbols like the flag and the tryzub. Perhaps playing at one-upsmanship, on 29 April, 1990, Ternopil flew the independence flag alone – that is, without the accompaniment of a Soviet flag. While the Ternopil election represented Svoboda's first "big win" in Ukrainian politics, the party had some success in local electoral politics in western Ukraine since it started running independently in 2006. Svoboda held 10 of 119 seats in the Lviv oblast council, and 9 of 90 seats on the Lviv municipal council. In all, the party had about 200 council members on local oblast, city and rayon councils throughout western Ukraine. Opinion polls for the 2012 elections suggested that Svoboda had a good chance of exceeding the 5% threshold required for representation in parliament, which in fact they did. In the 2012 parliamentary elections Sovoboda gained 37 seats in the 450 seat Rada. The poor showing by the nationalist "Svoboda" party candidate indicated that, despite difficult economic times, its agenda is still only marginally appealing to voters. Its main bastion of support lies in western Ukraine, where nationalist, pro-Ukrainian sentiment runs high and memories of Russian rule, whether Soviet or otherwise, remain deeply bitter. It has been a target of criticism in recent years for espousing ethnic intolerance and celebrating controversial heroes such as Stepan Bandera, the insurgent leader of a World War II-era independence movement but who is regarded in pro-Russian Ukraine and Russia as a terrorist. The party had also been accused of being funded and organized by the Party of Regions to funnel votes toward the ruling party from skeptical and frightened voters. President Victor Yanukovich, allegedly ceding Ukrainian sovereignty to Moscow, is seen as a traitor, one who would not hesitate to bury the sovereign Ukrainian state which was born after the decades of struggle for independence. In early 2013, Yanukovych's Party of the Regions organized "antifascist" demonstrations across the country, marching under the slogan "Towards Europe - without Fascists." With the confrontation with nationalist Svoboda, the government wanted to draw attention away from its own failures. Svoboda had a clear ceiling to its potential support nationwide. Svoboda is primarily an ideological movement, and is generally unprepared to actually govern and deal with real economic issues. Tyahnybok was successful in moderating his image, allowed him to appeal to more centrist voters. But he was backed by an undereducated and extremist base. Police and protesters clashed in Ukraine over the night of January 26, 2014, hours after embattled President Viktor Yanukovych tried to ease tensions by offering key government posts to two top opposition leaders. Yanukovych offered the position of prime minister to Arseniy Yatsenyuk, one of the leaders of the political opposition, which had waged two months of anti-government protests. Opposition leader Vitaly Klitschko, a former international boxing champion, was offered the post of deputy prime minister responsible for humanitarian issues. 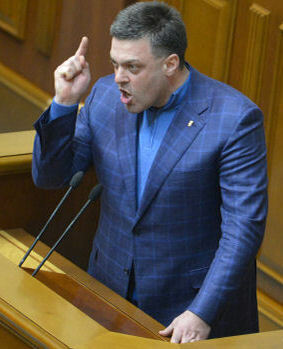 Tyahnybok, the third member of the opposition leadership, was not offered a job. European nationalists took an interest in the events of January 2014. The success of the nationalist party “Svoboda” during the 2012 parliamentary elections brought happiness to many European fighters against liberalism. However, the pro-EU course of the party afterwards both surprised and disappointed many of these comrades. The situation in Ukraine is indeed quite complicated. However, this is not a dead end and is not something the national-revolutionary movement in Ukraine cannot defeat. Regardless of what the leadership of “Svoboda” think, among “Svoboda” members there were a large number who were against the EU, a large number for whom a national revolution was the only possible path. Besides this, “Svoboda” was not the only nationalist movement in Ukraine. There were also other nationalist organizations in Ukraine, who were firm and consistent regarding their opposition to the EU. The Inter-regional Academy for Personnel Management (MAUP), is Ukraine's largest commuter university [ie, diploma mill], and also at one time purveyor of roughly 90 percent of Ukraine's anti-Semitic publications. The allegedly Libyan and Palestinian Government-funded Inter-Regional Academy of Personnel Management is the most infamous purveyor of anti-Semitic material in the country. It publishes the monthly journal "Personnel" and the weekly newspaper "Personnel Plus." Observers estimate that these publications run at least one major anti-Semitic article each month. For example, Personnel Plus published in its April 14-19, 2005 edition an "open letter" to President Yushchenko, Rada Speaker Lytvyn and Supreme Court Chief Justice Malyarenko calling for a parliamentary investigation into the "criminal activities of organized Jewry in Ukraine." Personnel Plus claimed this letter was signed by more than "100 scientific, civic, and political leaders" including two M.P.s, one of whom (Oleh Tyahnybok) was kicked out of the Our Ukraine parliamentary faction because of his anti-Semitic views. In 2007 U.S. white supremacist David Duke was banned from entering Ukraine, after he visited the country several times to appear as guest speaker at events hosted by MAUP. Duke, who has an honorary doctorate from MAUP, had taught at the school's Kiev campus. Duke had entered Ukraine in June 2005 to attend an infamous MAUP conference that, among other things, called for the expulsion of all Jews from Ukraine. The presence of such a "famous anti-Semite and xenophobe" had generated media interest in the June 2005 conference and had deeply offended Ukraine's Jewish community. The party’s mission is the realization of “Ukrainian national idea - an idea of self-affirmation of the Nationand creation of a state with a system of Ukrainian national and social sovereignty of the people”. According to UNA-UNSO, the regime in Ukraineis “cosmopolitan and demonstratively anti-Ukrainian”, and it is important that immigration be stopped and that the right to live in Ukraine be granted only to the “foreigners of Ukrainian origin who can prove their Ukrainian ancestry”. Originally a coalition of nationalist groups that venerated Mussolini, it declared itself a political party in 1991. In response to the August 1991 anti-Gorbachev coup attempt, the organization formed a paramilitary wing - the Ukrainian People's Self Defense Organization (UNSO). UNSO fighters were reported to have participated in the 1992 Moldova-Tranistria conflict against Moldovan forces, the 1993 Georgia-Abkhazia war on the side of Georgia, the 1995 conflict in Chechnya on the side of the Chechyens, and in the 1999 Kosovo conflict on the side of the Serbs. The organization first registered as a political party in 1994 and was subsequently deregistered in 1995 for its radicalism. It was reregistered in 1997. UNA-UNSO has limited representation on local councils in western Ukraine and received 16,379 votes in the March 2006 Rada elections. It was involved in the "Ukraine without Kuchma" movement in 2000-2001 and 18 of its members were arrested for violent clashes with police, including Andriy Skhil, who later left the party and is now an MP with the Yulia Tymoshenko bloc. UNA-UNSO supported Yushchenko in the 2004 elections. Bratsvo (Brotherhood) is a civic movement without clear ideology or platform founded in 2002 by Dmytro Korchynskiy, a former UNA-UNSO activist. The movement focuses on radical means to change the political process and honors disparate figures such as Stalin and Stepan Bandera, a Ukrainian Nationalist who headed the Organization of Ukrainian Nationalists (OUN) 1940-1944. In 2004 Korchynskiy ran for president and got 0.17 percent. In 2005 Bratsvo joined forces with Natalia Vitrenko's extreme left-wing Progressive Socialist Party in an unsuccessful effort to attract votes for the 2006 parliamentary elections. In a text published on its Internet site on 27 February 2005, UNA-UNSO states that the 2004 presidential elections divided the country in two parts - Ukrainian and non-Ukrainian: “It is clear that ‘ethnically pure’ part of Ukraine voted for Viktor Yushchenko unanimously, while, for example, in Kharkiv region due to the abhorrent ‘Russification’ resources the votes divided in half.” UNSO obtained 6 percent of the votes in the 2006 elections through aproportional vote system. Tryzub [Trident] Tryzub has becomed more active and gaining the support of Ukrainian citizens. They plead for a monoracial and monoethnic state, call for “racial hygiene” and struggle against migrants, use both slogans of economic populism and violent methods against their ideological opponents. The trident - tryzub - is the national symbol of Ukraine. The state coat of arms of Ukraine or commonly the Tryzub is the national coat of arms of Ukraine, featuring the same colors found on the Ukrainian flag; a blue shield with yellow trident, called the tryzub. It means the triune God on earth and in heaven. The earliest archeological excavations of the trident date back to the first century A.D. Ukrainian Grand Prince Volodymyr the Great used the trident on his gold and silver coins. In 1918, the Trident was approved by the Central Rada in Kyiv as the official coat of arms in independent Ukraine. The Ukrainian flag is made up of two horizontal stripes, the upper one light blue (symbolizing the open sky) and the lower - yellow (symbolizing the wheat fields of Ukraine). Both the blue-yellow flag and the trident have been restored since Ukraine's declaration of independence on 24 August 1991. Dmitry Yarosh has a regular Soviet high school in a central Ukrainian city of Dneprodzerzhinsk and two years of military service in the Soviet army behind him. Soon upon his return from the army in 1991, he founded his nationalist group Trizub (this word is the Ukrainian for the English Trident). One could call this organization just a patriotic group, bearing in mind that a trident is a Ukrainian national emblem. The problem was that Trizub from the start bore the name of an extremist Ukrainian nationalist, Stepan Bandera. This person became a cult figure in modern Ukrainian ultra-right groups, because he helped Hitler’s army to evict the Red Army from Ukraine during the Nazi invasion of the Soviet Union in 1941. One more reason for Yarosh’s adoration for Bandera is the latter’s adoration for the so called “national revolution” in Ukraine. In Yarosh’s opinion, “national revolution” is impossible without violence and that it should lead to a “purely Ukrainian” state with the capital in Kiev. The other stated aim of the “national revolution” – destruction of what Yarosh calls the Russian empire, might be more to the West’s liking. Yarosh explains his hatred for this so called Russian empire very simply: with that empire in place, Ukraine will never be totally independent. A typical episode for Tryzb came in January 2011, with a wave of detentions, searches, interrogations of members of the organizations VO Svoboda [the Freedom Party], V.O. Tryzub and other similar organizations. At first the talk was of suspicion of having carried out the explosion of the bust of Stalin in Zaporizhya late in the evening of 31 December 2010. Several members of Tryzub were detained and released. Ukrainian lawmaker Dmitry Yarosh said 11 November 2015 that he had resigned as head of the radical Right Sector organization. Citing numerous wounds, Yarosh said that he had entrusted managerial duties to his closest associates. The Russian Supreme Court recognized the Right Sector as an extremist organization in November 2014. Russian investigators earlier opened a criminal case against Yarosh over extremism and terrorism, Sputnik said. The Right Sector, an association of ultra-nationalist organizations took an active part in the anti-government protests that led to the ousting of former President Viktor Yanukovich in February 2014. Patriot of Ukraine was originally the youth wing of the Svoboda political party, dissolved in 2004. In 2005, it was registered as a civic organization and is not officially connected with Svoboda or any other political party. Patriot of Ukraine protested against Kharkiv court rulings making Russian the second official language in the city. It has local branches in Kyiv (2006), Poltava (2008), and Chernihiv (2008). Its official ideology is Social Nationalism, a cult of the nation within a state, which is anti-immigrant ("Ukraine for Ukrainians"), anti-capitalist, and anti-globalist. In April 2008, it began to cooperate with organizations such as the Ukrainian National-Labor Party and pro-Russian Crimean Cossack groups. Ukrainian National-Labor Party is an unregistered organization led by Yevhen Herasymenko. This party bases its ideology on national-socialism. Its members are mainly skinheads and neo-Nazis believed to have been involved in physical attacks against minorities. It has regional representation in the cites of Simferopol, Uman, Vinnytsia, Zaporizhia, Ivano-Frankivsk, Kyiv, Kirovograd, Lviv, Kotovsk, Rivne, Ternopil, Kharkiv, and Kherson. The organization is reported to cooperate with Svoboda and the Ukrainian Conservative Party lead by the president of the Interregional Academy for Personnel Management (MAUP) Heorhiy Shchokin, known for promoting anti-Semitism. Ukrainian Movement Against Illegal Immigration is an unregistered organization which is reported to have a following among neo-Nazis, promotes white supremacy and is opposed to immigrants - especially from Asia and Africa. The movement has two wings, a pro-Russian wing mostly based in Crimea and a pro-Ukrainian wing. Some experts allege that both wings get financing and guidance from Russia while others assert that the two wings are independent of one another and have ideological differences. The pro-Ukrainian movement is headed by Oleksander Bielov.